No matter how many people are on your gift list, there’s always room for one more, right? Especially if the recipient happens to be you! This Christmas, treat yourself to the gift that lasts a lifetime—a complete smile. With dental implants in Ft. Collins, CO, Dr. Lindsey and her team at Aspen Dental Care can replace a missing tooth and give you a smile that you’ll share confidently at holiday gatherings. Dental implants are one of several tooth replacement options including crown and bridge, a partial or dentures. 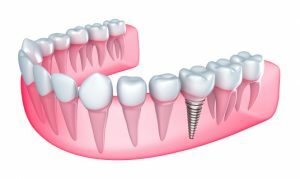 What makes dental implants different from these others is the fact that they replace both the crown and root of a tooth. So while the other options will certainly make your smile look better, implants also help you maintain a healthier smile and jaw. Dental Implants: What Are They? Most people refer to the entire tooth restoration as a dental implant. Actually, however, the implant is that portion embedded in your jawbone, and the tooth restoration is what everyone sees when you smile, talk or laugh. A dental implant consists of a small screw that an oral surgeon or periodontist surgically places in your jaw. The implant is embedded beneath the empty socket and is positioned to take advantage of bone volume. Made of the biocompatible metal titanium, an implant is able to bond with surrounding bone tissue. This bond not only creates a secure foundation for your eventual tooth restoration, but also helps to prevent bone degeneration. The implant stimulates healthy new tissue growth, so you’re able to avoid the bone loss that causes many people with missing teeth or other restorations to look older. Depending on the number of implants your smile needs and their location in your jaw, healing takes anywhere from three to six months. After this time, you’ll return to see Dr. Lindsey so she can design the perfect tooth restoration. Our dental lab will handcraft a porcelain crown, bridge or denture that will be permanently secured to dental implants. Once in place, your new tooth will allow you to enjoy a well-balanced diet and to smile confidently at the people around you. Caring for your dental implants is really no different than caring for natural teeth. They require twice daily brushing and flossing at least once a day. Plaque is just as likely to buildup on implants as natural teeth, so good oral hygiene is essential to the health of your smile and longevity of your implants. If you would like more information about dental implants or to schedule a consultation with Dr. Lindsey, please contact Aspen Dental Care.